Neoconservative analyst Bill Kristol and advocacy group American Oversight have called out the Department of Justice for not making Acting Attorney General Matthew Whitaker’s financial disclosure reports public. 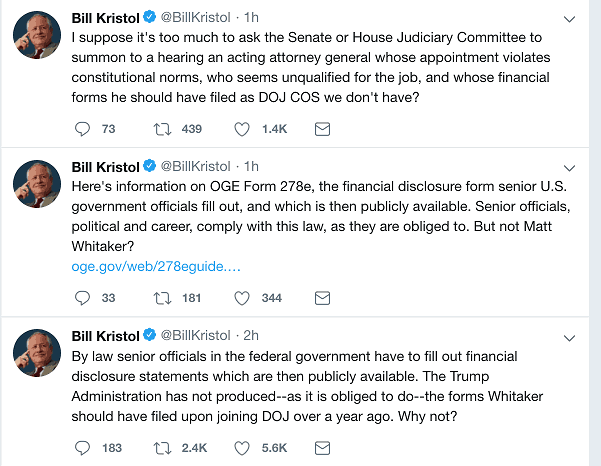 Kristol asked the Senate or House Judiciary Committee to summon a hearing on the acting attorney general and noted that Trump administration has not produced, as it is legally required to, forms Whitaker should have filed when he became a senior official in the DOJ more than a year ago. American Oversight wrote the Office of Government Ethics to investigate the Department of Justice for not allowing an inspection or providing a copy of Acting Attorney General Matthew Whitaker’s public financial disclosure reports in a letter dated November 16. “… transparency is a critical component of the government ethics program of the federal government,” according to the letter the advocacy group sent to the OGE’s director regarding the DOJ’s failure to share the financial report. To date, the Department of Justice has not allowed inspection or furnished a copy of Whitaker’s public financial disclosure reports, despite the overwhelming public interest in understanding the potential conflicts of interest involving the new Acting Attorney General.